Lawsuits are always risky. There’s a term for it: ‘Litigation risk’. As a person with a law degree, Jordan Williams should know that. The boy-wonder with a penchant for deceit first caught my eye as the ‘front’ (as in, public face) of the grubby and dubious anti-MMP campaign ‘Vote for Change’. I wrote about that at the time and Jordan Williams features here at The Paepae now and then. This is funny too. Jordan Williams hawking for work with Trevor Mallard(!) in 2012. Cathy Odgers slamming him down. The VFC frontchild Jordan Williams is [a] supercilious little prick who acted like a second rate twit during the recent Brash ACT coup. If anything I shouldn’t wish to be associated with them. I make no bones about it: I long ago formed a personal view that Jordan Williams is a shallow puppet and nasty, vacuous, sleazebag who, like Slater Jnr, will hypocritically use other people as weapons to attack his elders’ enemies. Just like Slater Jnr, accuracy is not his strong suit. This week, presenting his ‘evidence’ in his defamation case against Colin Craig, it seemed to me he again confirmed my view. 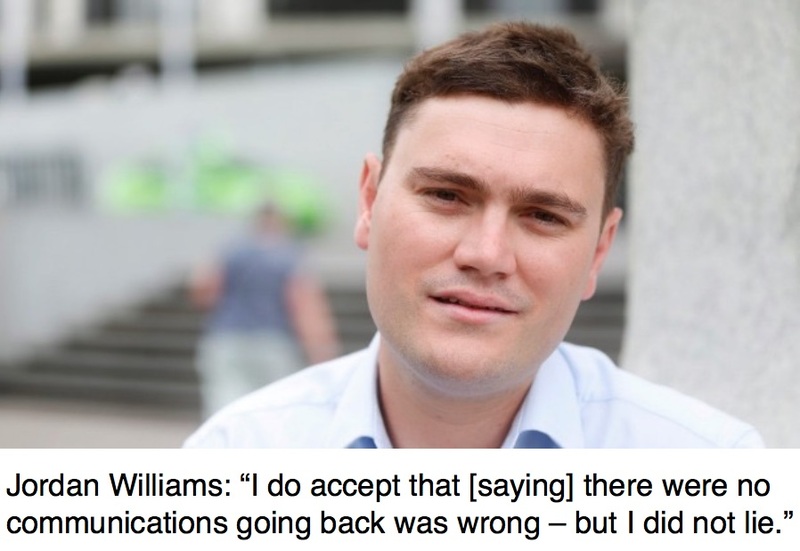 It’s been revealed in court this week – out of Jordan Williams’s own mouth – that he has repeatedly made untrue, “wrong” and inaccurate statements. Things like: messages from one party to another were “never reciprocated” when they were. Jordan Williams’s grossly offensive description of women, revealed in the Whaledump leaks, will follow him everywhere. So will his reputation for using deceit, revealed in Dirty Politics. Quite right. What an arse. Describing himself as ‘a whistleblower’ in these circumstances is preposterous, and an insult to whistleblowers. 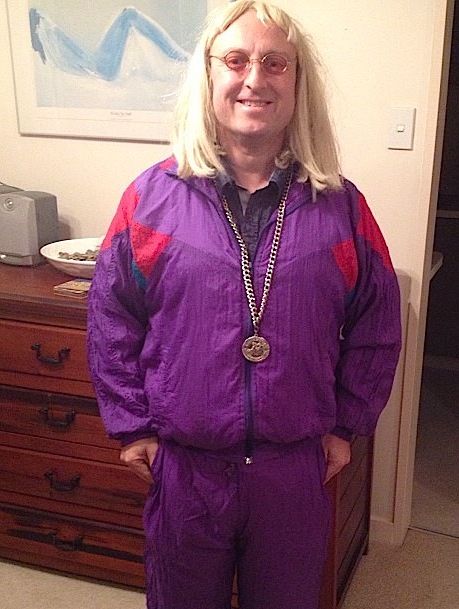 David Farrar – co-founder (apparently) with Jordan Williams of the thin astroturf lobby group ‘NZ Taxpayers Union’. I personally see this sleazy apprentice just as I do his sleazy masters Simon Lusk, David Farrar (right) and Cameron Slater: Contemptible character assassins. 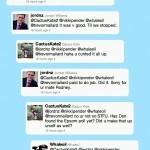 The way I see it (described here: Is Colin Craig ‘defaming’ Cameron Slater and his commercial attack website? ), the smearing of Colin Craig was a decapitation attack, fitting the old-as-the-hills pattern of using a political figure’s foibles, idiotic weaknesses and lapses of judgement in his personal life as a political cudgel with which to beat him. Hager’s book Dirty Politics reveals such smear campaigns are Simon Lusk’s and Cameron Slater’s bread and butter, modus operandi and the trigger of their wet dreams. (OK, I’m speculating about the wet dreams.) They don’t give a rat’s arse for the damage they do to others caught in the crossfire while they spout about ‘morality’. Consider Jordan Williams’ role in the light of Luigi Wewege. You get the picture? And for Cameron Slater, who took such protracted umbrage at his own extramarital affair being made public, to continue his sleazy walk down this path only deepens my contempt for his warped sense of so-called morals. And, surely, it must smell fishy to his Seventh Day Adventist enablers? Surely? Or they’re hypocrites too. For Jordan Williams to cite the Christian values of the Conservative Party, its founder and board in court in these circumstances is beyond satire, and I have nothing printable to say about that at the moment. And what a sad, deluded fool Christine Rankin must feel now describing Jordan Willams to a Judge and jury as “a trusted contact” and his half-baked dossier as “direct evidence from someone I trusted implicitly”. Boy, I could have saved her some trouble. And as for that part: “Williams begged Rankin not to take any action”, sure. Read that in the context above. It looks to me like he played her like a fiddle. Facts are stated to the best of my knowledge and commentary is my honest opinion. Corrections or clarifications are always welcome by email. Comments are open, but may be moderated. What else has Jordan Williams got “wrong” in his evidence? Superb article. Great research. I cut and pasted (as Bearded Git) some parts of Dirty Politics that relate to Jordan Williams on The Standard a couple of days ago. This whole lawsuit is the very definition of a win-win situation. Not for the ones involved, of course, but for us spectators. As the blows keep coming, you can’t really decide which side you’d rather win, because it doesn’t really matter anymore.